Just finished consolizing a MV1FZ board, and thought I would show some pictures of where to grab RGB and Sync and Controller port wiring from the bottom of the board.. Via the wire coloring its easy to see whats what. The yellow is sync. I have circled and labeled which point corresponds with which controller wire. I haven't seen this info anywhere else, so I thought others might benefit from it. Last edited by Yodd; 08-05-2012 at 11:22 AM. Thanks for taking the time to put this info up. A picture is worth a thousand words, this is pretty awesome to have documented. Thank you for this! I also have a controller port pinout diagram for the bottom of the MV1B if anyone's interested. Post it up but make another thread I think for search purposes. I bought 2 mv1fz that needs some repair. started yesterday a new cmvs - 1fz. I assume the one from MKL? Total cost should be less than $10 with plenty of left over parts for future use. Obviously Capacitors should be mini electrolytic and can be rated for a higher voltage without any negative effect. I would suggest 1/4 watt resistors or 1/2 watt at the largest to help keep the board smaller. Last edited by Yodd; 08-08-2012 at 06:54 AM. That really does come in handy, since i'm about to mod a 1FZ for myself. Thanks, Todd. Serious, serious problems man, you have them. My doubt, was reading those "2SC1815 Transistors"
Last edited by dragonpt; 08-08-2012 at 07:46 AM. I assume for that 20 Euros you have some spares left over? When I went to buy those 1815 Transistors I ended up buying a bag of 100. So far I have used 4. Its about 1 inch wide by about 1.5 inches long or so. Around half an inch tall and that's with 1/2 watt resistors. I imagine with 1/4 watt resistors and some creative spacing you can shrink it even further. If there was enough interest, we could do some professional PCBs for these. Credit would go back to MKL since he provided it to us. Last edited by Yodd; 08-08-2012 at 08:12 AM. dragonpt has pointed me this way. Great info in here, I want to tidy up my own CMVS now. There's the saying if it ain't broke, don't fix it, but then I've never been happy with the mess of wires coming off of the jamma connector! I'm doing the same circuit too. I'm an big fan of mmonkey, it was your (old) site, that make me started making mods on consoles. Last edited by dragonpt; 08-09-2012 at 04:20 PM. Hi Broken, I could really use your help. Gladly admit I don't really know what I'm doing, but I have the same board as you that I'm trying to wire up. I've looked at some RGB socket diagrams, and they seem to say I need a wire up component, but I have no idea where to get that from the board. Colours are pretty much corresponding. Would really appreciate any aid you can offer. Sorry, I'm confused as to what you need assistance with. Are you trying to wire that to correspond to the NeoGeo 8 pin din output? Yep, so I can use the RGB cable I have for my AES. Is it not working or? lol you really need to provide more info so we can determine what exactly you are asking for. I see you have the composite sync wired to the composite sync pin on the Neo 8 pin wiring. However, if you are using a standard Neo Euro scart cable, 99% of the time they are wired to use composite video as sync. You can either mod the cable, or the simpler solution would be to move composite sync on your 8 pin din socket over to pin 3 (which would correspond with composite video on a Neo AES). Broken you are a star, wiring the sync to pin 3 finally gave me a picture! None of the guides I read mentioned that. Mind if I ask a few questions while I've got you. The picture seems really bright, is this something I can tweak on the board? Also how do I wire up the sound? Glad to hear the sync is worked out. As far as being too bright, you need to install some resistors on the rgb lines. Anywhere from 125 to 150 ohms should bring it down to a more reasonable level. As far as audio goes, towards the top of this thread is a circuit to mix and amplifier stereo audio. Otherwise you would grab mono audio from the jamma edge. Broken, I want to pick your brains for a bit longer, if it's derailing your thread, let me know and I'll start a new 1. I don't know what much about electronics, other then how to use a soldering iron. With the resistors on the RGB lines, would there be a way to vary the resistance and also do it on all 3 lines at once? The PSU I'm using gives out 5.4v, is this dangerous? 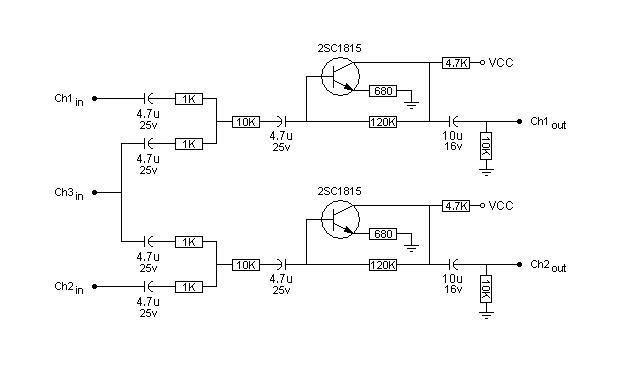 If so how would I go about lowering the voltage. In regards to mono audio, which wire do I need to connect up, the +, the - or both? I've tried just touching them on the pin and I get nothing. Again, if you don't want this here, I'll delete my post and start a thread. Cheers for this great help thanks. Master Brewer, Genzai Sake Co. I ask the deletion authorized by Neo Geo Admin Judge Dredd. If the consolization was done correctly then it should plug into a cab no problem. Most open face CMVS units are still able to be put in cabs. The only time they aren't is if the person removed the 7805 for the secondary +5v rails that powers the op-amps in the sound section. As long as those pre-amps are getting +5v and the amp is getting 10-12v then you'll get sound in the cab. i'm thinking of consolizing a mv1fz i'll get soon and here i am. i dont post often here, but here is my little contribution to that project. you can upload it on oshpark.com and you'll get a board ready to be soldered. resistors needs to be "upright" like broken did just on post #12.
soon i'll receive 3 boards and i only need one. if someone want a board, i can send it. but price on oshpark are unbeatable : 1.13x0.82 inches (29x21mm). $4.60 for three (and i live in france, shipping fee worldwide are free). if something is not like the schematics, please tell me, i'll correct it asap. Last edited by tawy; 01-05-2015 at 03:10 PM.